Fine grey-green cut foliage and large flowers vivid blue to dark purple in centre from April to end of June. 10cm. Trough, scree or raised bed. 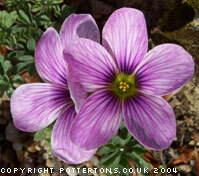 The gem of all the Oxalis, a hybrid between laciniata and enneaphylla which was raised by the late E.B.Anderson. Cultivation as enneaphylla.